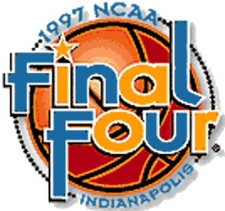 The 1997 NCAA Men's Division I Basketball Tournament involved 64 schools playing in single-elimination play to determine the national champion of men's NCAA Division I college basketball. It began on March 13, 1997, and ended with the championship game on March 31 in Indianapolis, Indiana. A total of 63 games were played. Arizona, coached by Lute Olson, won the national title with a 84-79 overtime victory in the final game over defending champion Kentucky, coached by Rick Pitino. Miles Simon of Arizona was named the tournament's Most Outstanding Player. Arizona also became the first school since the introduction of the 64-team bracket to defeat three number 1 seeds in the tournament. Miles Simon scored a career-high 30 points and hit four free throws in the final 41 seconds of overtime as Arizona capped an incredible run to its first NCAA Championship with a stunning 84-79 overtime victory over defending champion Kentucky at the RCA Dome in Indianapolis.